Welcome to our Business Compliance Guide! The resources in this Guide will help you maintain compliance while you grow your business. 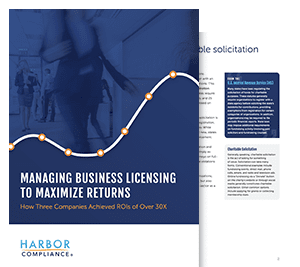 Whether you are adding products or services, expanding to new states, or hiring employees, compliance is a necessary part of your business operations. Look to this Guide to gain knowledge on the different aspects of compliance and review the information specific to each state. This guide covers compliance issues for existing businesses. If you have not already incorporated your business, please visit our Business Startup Guide. Businesses seeking to expand to a new state generally must obtain a certificate of authority to conduct business in that state. This process is known as foreign qualification. Foreign qualification enables your company to legally pursue growth opportunities across state borders without having to incorporate a new business entity. During the formation and foreign qualification processes, the company designates a registered agent to receive notice of lawsuit (service of process) and government paperwork. Without a registered agent, state authorities will not approve business filings. Most businesses appoint a commercial registered agent, which provides a registered agent service through a network of offices in every state. Sales tax is imposed on the sale of most tangible products and some services, while use tax is collected on out-of-state goods that were not taxed and will be used or consumed in the home state. Most states allow businesses to register for sales and use taxes with a consolidated tax registration form. Payroll taxes are required when companies have full-time employees. Payroll taxes usually include employer withholding and unemployment taxes. Less than half of states currently allow business entities to register for both taxes using the same application. Also, most states process unemployment tax through a separate agency. Regulated professions are overseen by boards dedicated to the standards of the industry. Licenses might be required for both by key individuals as well as the business entity. Most industries are regulated by state boards with a few key business types being regulated by federal agencies. Most business entities are required to submit periodic reports to each secretary of state with which they are registered. Periodic reports update basic information about the company including the principal address, registered agent, and officers and directors. Reports must be filed annually in most states, however some states require filing biennially. State fees vary but average $50. Keep track of these reports and file on time to stay in “good standing” and avoid state penalties. Banks, vendors, licensing agencies, and others will request documentation that proves your business has satisfied licensing requirements. To provide this evidence, a form and fee is filed to retrieve certificates of good standing, certified copies, and to obtain apostilles and certifications for international business. Look up state fees and timing for Certified Copies of Articles of Incorporation. This page was last fact-checked December 14, 2016.